Turbo ovens, or countertop convection ovens, are manufactured under a variety of brand names. All turbo ovens work in much the same way: a fan mounted on the lid circulates the hot oven air around the food, which makes the food in the oven cook faster and more evenly. 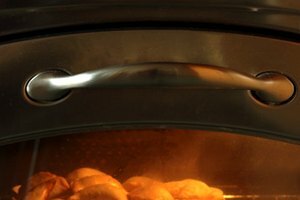 Turbo ovens use less electricity than a conventional oven, making them energy efficient and cost saving. Turbo ovens may have as few as three parts or as many as five or six. 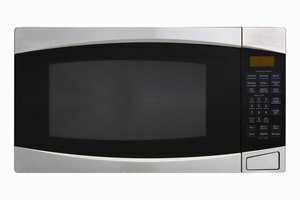 Most turbo ovens have a glass bowl that is considered the oven itself. The lid of the oven contains the fan and heating element. On the top of the lid, the oven will have either manual or digital cooking controls. If the oven has a base plate, the glass bowl fits into the plate. A wire rack is placed in the bowl, and the lid is secured on the top. 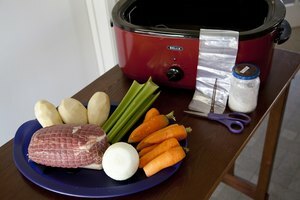 Some models include an expansion ring that fits on top of the bowl before the lid in order to cook larger items, such as small turkeys or rib roasts. Using a turbo oven is basic. Place the food to be cooked on the rack inside the bowl. Lock the lid in place, set the timer and the thermostat, and start the machine. When cooking, place food in a single layer on the rack. If your oven has an optional second rack, you can cook an entire meal in the oven. Place meats on the lower rack and put potatoes or vegetables on the upper rack. When setting the oven temperature, use the same temperature you would normally cook the item in your regular oven. Set the timer for half the normal cooking time, unless the food is frozen. With frozen foods, the time needed to cook will be approximately the same as if cooked in a conventional oven. The lid of your turbo oven should never be immersed in water. Instead, clean the lid using a moist, soapy sponge or dishrag taking care to clean around the fan area where grime is likely to build up. You can clean the rest of the oven by washing it in hot soapy water and rinsing thoroughly. Some models have a "self-clean" mode. To use this feature, fill the oven to the marked fill line with water, secure the lid on top and select wash and a 10-minute cycle time on the cooker. 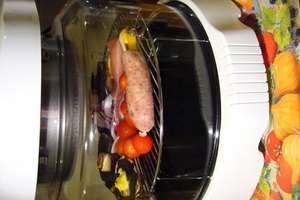 If you purchased a turbo oven at a garage sale, thrift shop or flea market and do not have the manual, download one of the many that are available online. Since most operate in the same way, any manual will give you approximate cooking times and temperatures for most foods along with recipes that you can use to create your meals. See the links in the Resource section to locate different manuals.